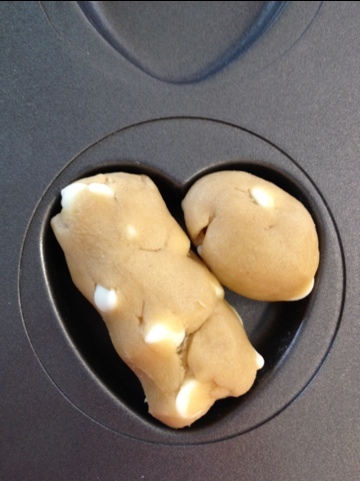 I had a bit of leftover cookie dough after doing some decorated cookies, so I whipped these up for snacking purposes. I thought it would be an easy and cute little treat for St. Patty’s Day! My little brother is across the country doin’ his thang in the navy. 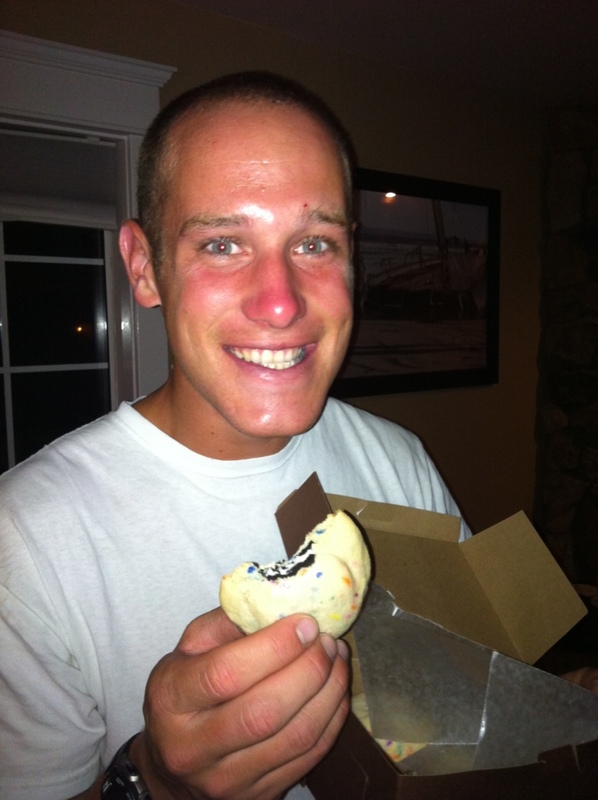 But it’s almost his birthday, and I needed to bake him something, so I had to mail it! 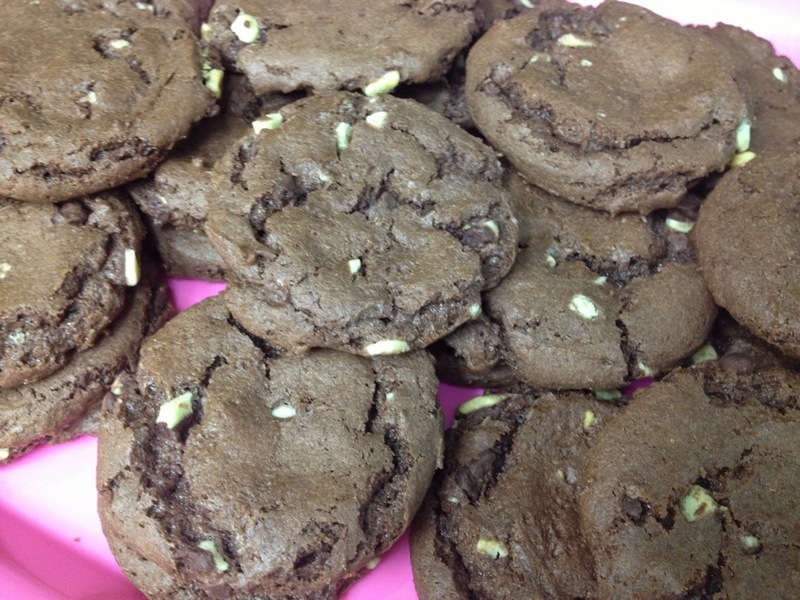 I have sent him brownies in the past, but I figured cookies share better and can be transported more easily, so I wanted to bake him up some cookies this time. In the end I decided since I couldn’t decide on a flavor, I would just do as many as I could. I made him Everything But The Kitchen Sink Cookies. Never heard of them? 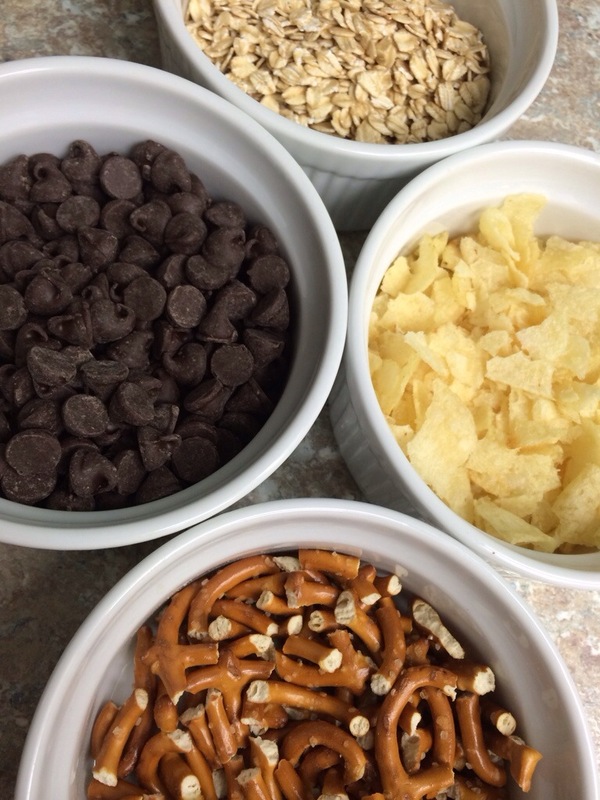 Well, as the name suggests, there are a lot of different flavors and textures mixed into these! 1. 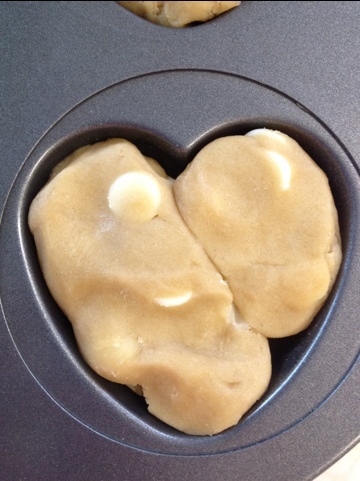 Beat together sugars and butter. Add eggs and vanilla, scraping the sides of the bowl down halfway through. 2. 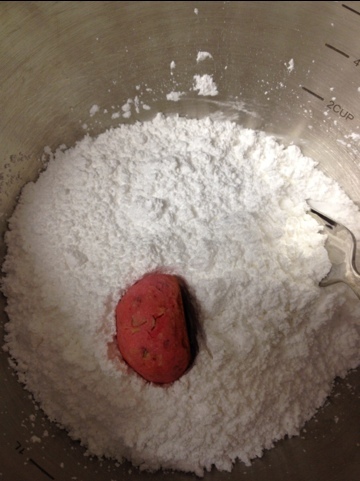 Add salt, baking soda, and baking powder, then slowly add the flour. 4. Mix the fix-ins in by hand. I did the potato chips last because I didn’t want to over-crush them. 5. Refridgerate the dough overnight. This part suuuuucks. But seriously, it melds the flavors together so much better. Do it. 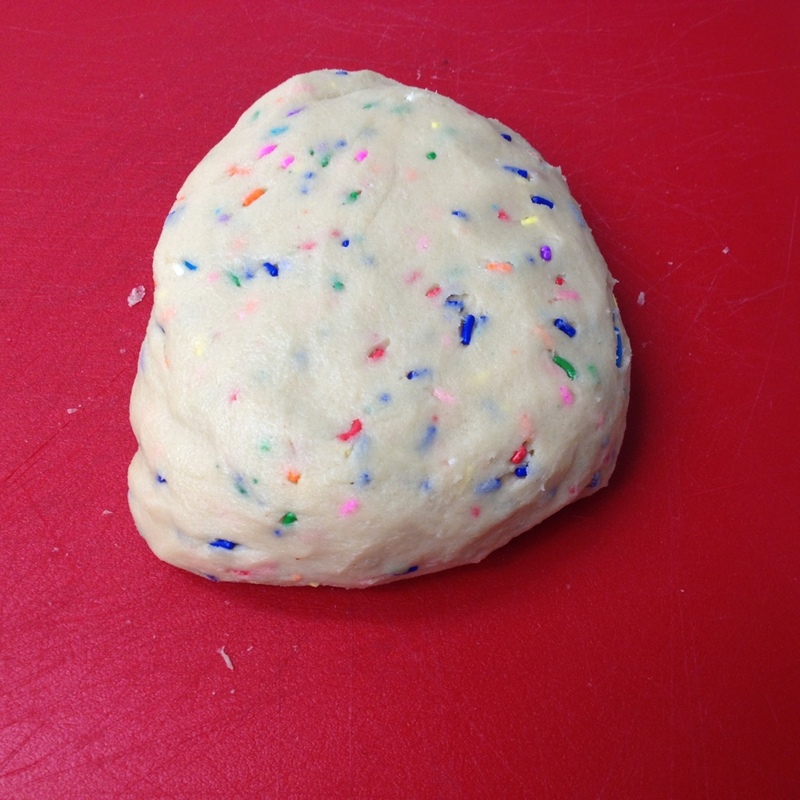 Plus, cold dough is easier to work with. 6. 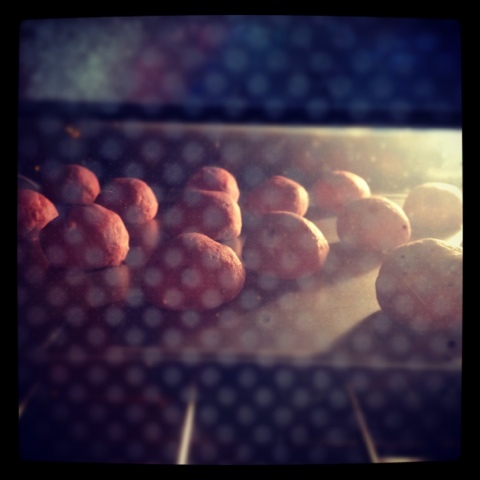 Make tablespoon sized balls of dough, then squash them flat with the bottom of a drinking glass. 8. 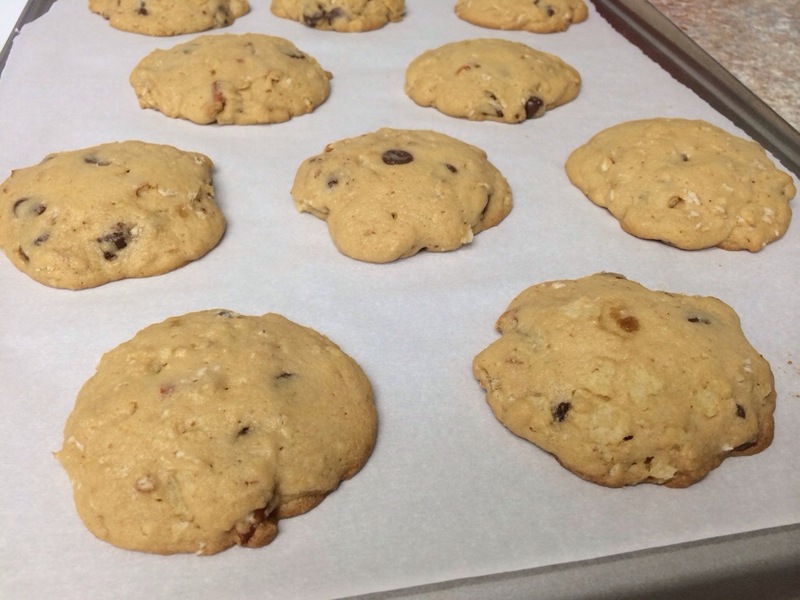 …then once they cool (let them cool on the pan) they will flatten out and set up. 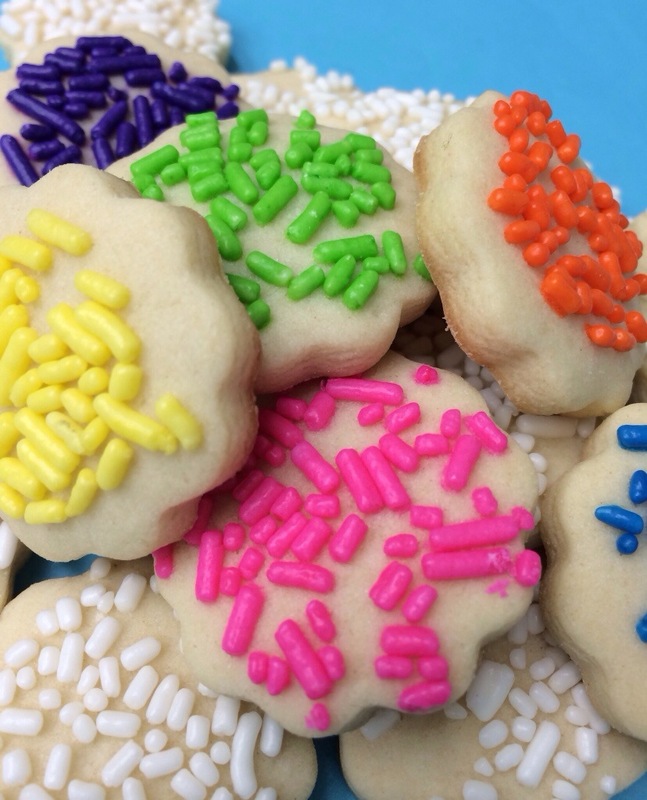 These cookies are perfect for the beginner sugar cookier. 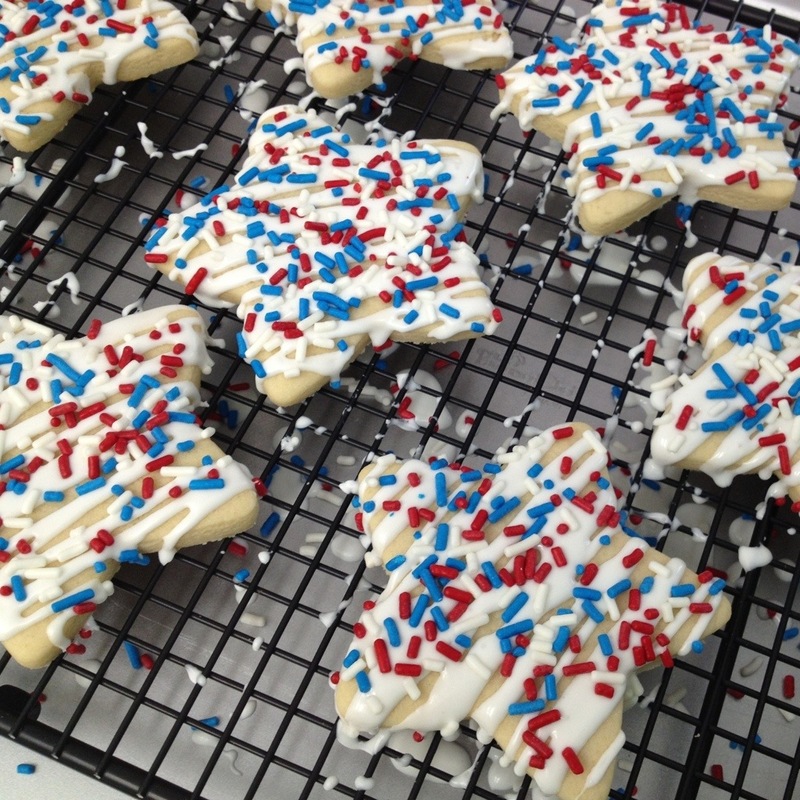 They are glazed, but not delicately so, and covered in the all-important sprinkles! I was throwing them together Monday morning for a little BBQ at a friend’s house, so I didn’t have a lot of time (or energy) to spend on them. 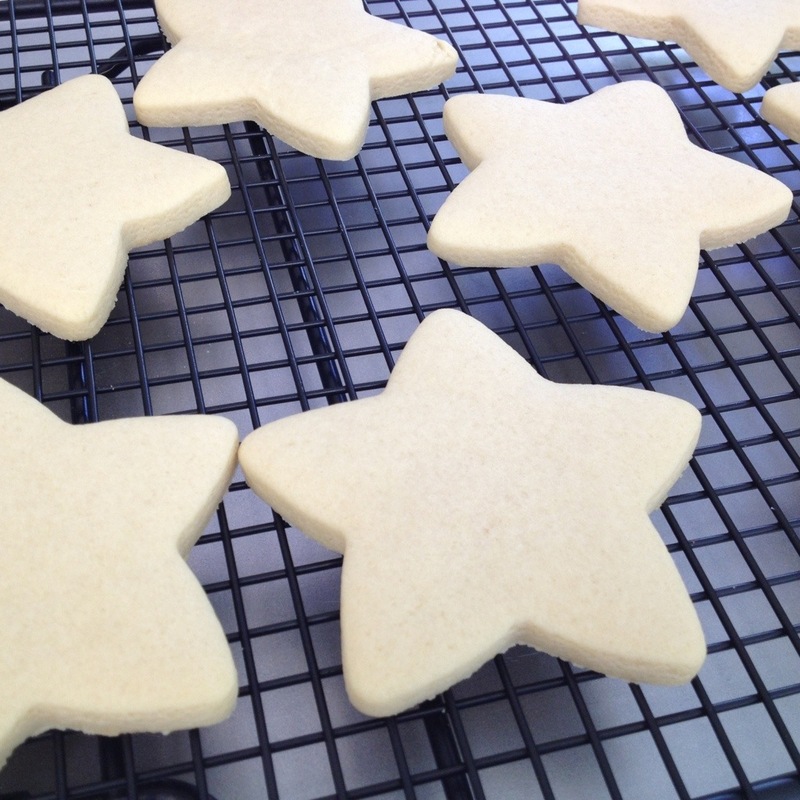 ALSO, I know I am getting annoying with this, but I have a new sugar cookie recipe. I have been using this one for a while now, and it’s absolutely perfect. 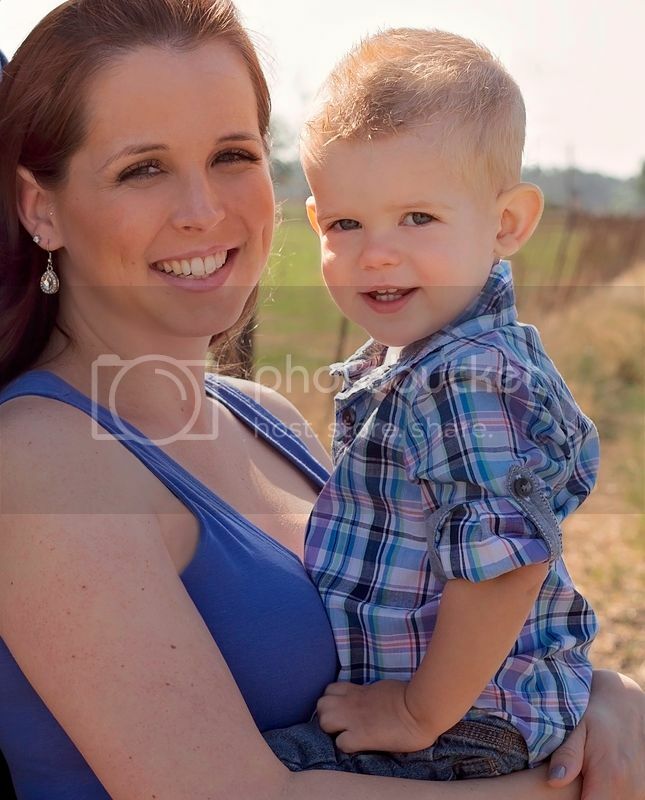 I linked it up here and changed the links on my other posts. 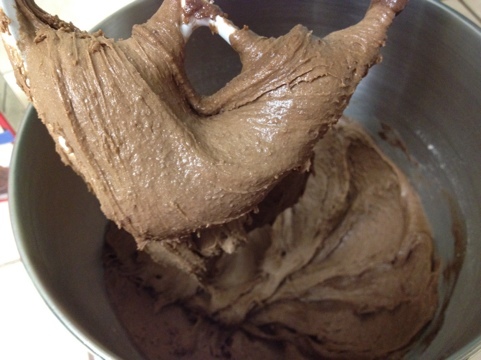 I’m also going to actually share my “recipe” for my icing. I finally took the time to measure how much of each ingredient it takes to make it the perfect consistency… rather than just guessing every time. 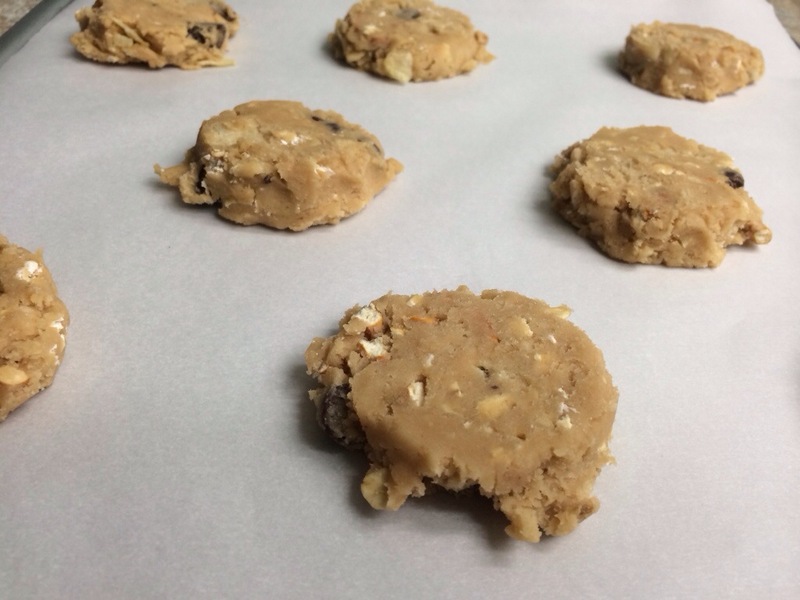 For these easy cookies, I rolled the cookies extra thick with my 1/4″ dowels. I chose to do stars because it was Memorial Day, but any basic shape will do. 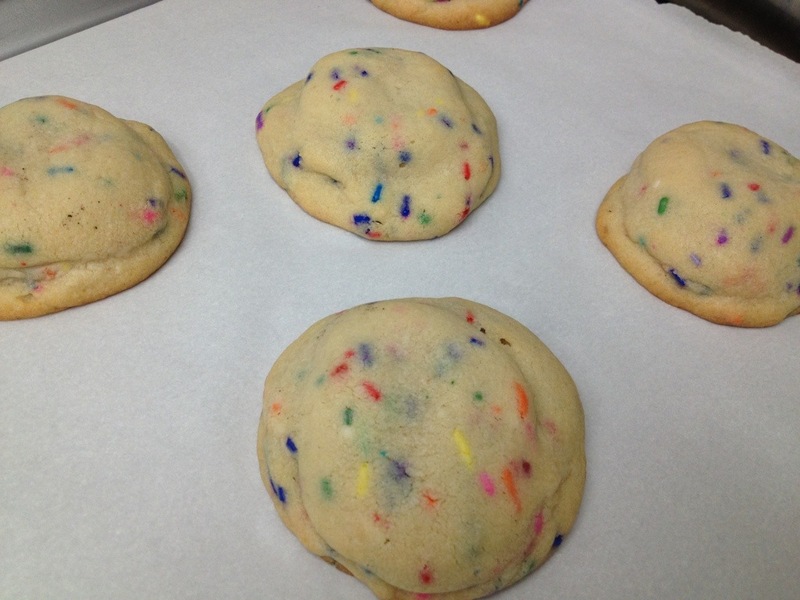 Spread the cookies out on a wire rack and set it on top of another pan or a piece of waxed paper. 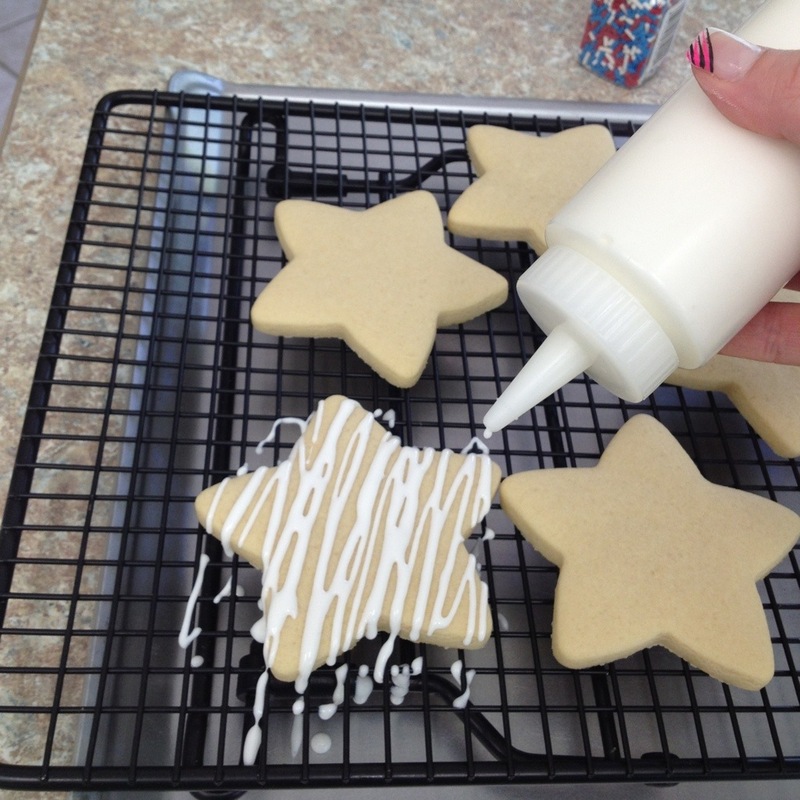 Mix up your icing and put into a squeeze bottle or zip-top baggie with the corner cut. 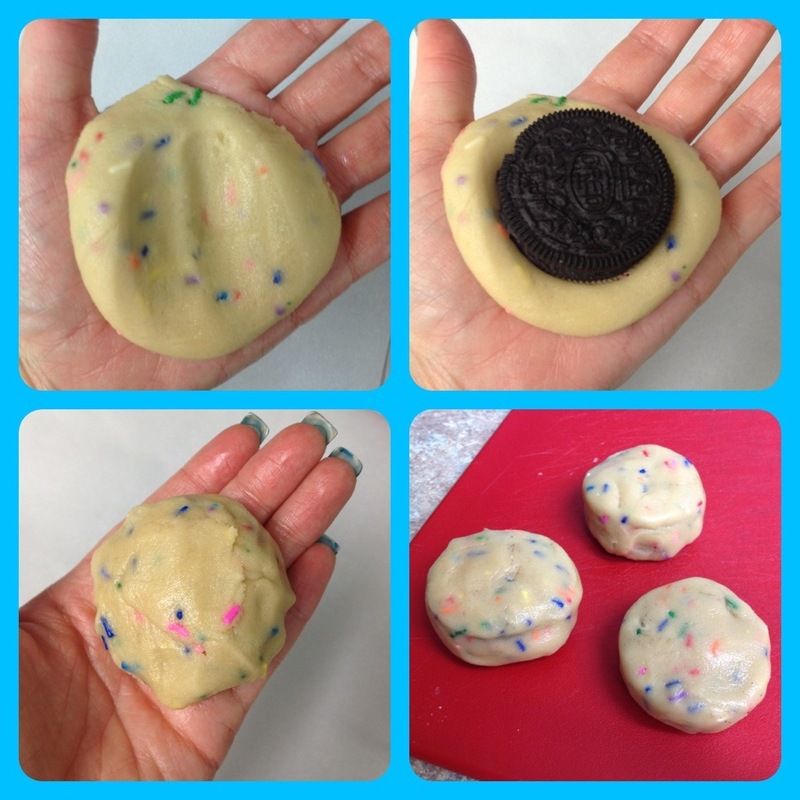 Drizzle haphazardly across the cookie in the same back-and-forth direction. I just used white icing for simplicity, but colored icing, or multiple colors drizzled together would look super cute! 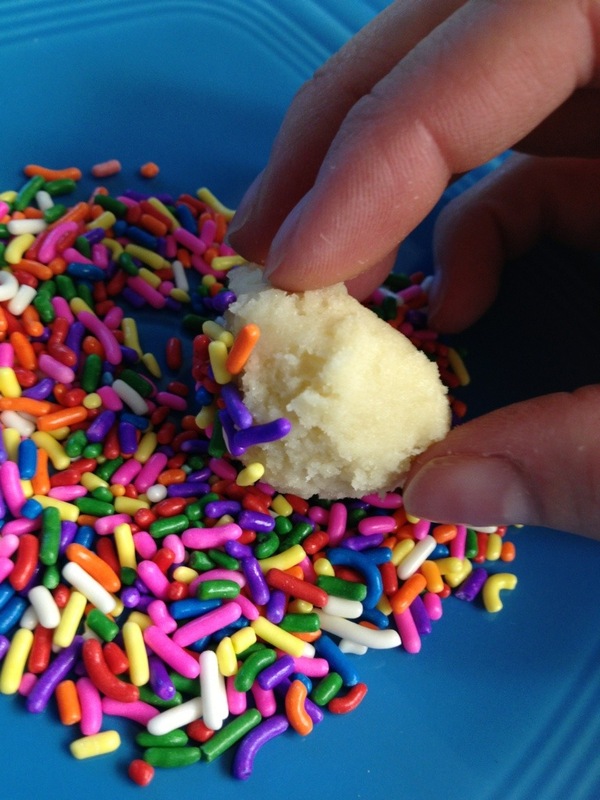 It doesn’t matter if it’s messy looking because we’re going to throw sprinkles on top. 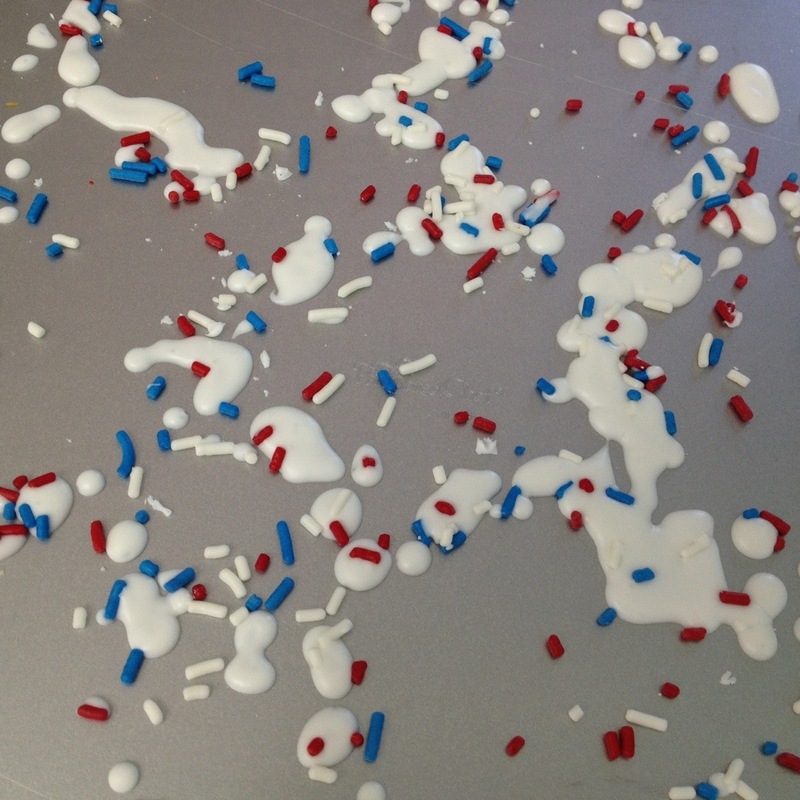 Here is a shot of my beautiful icing and sprinkle party after-math. I wish it was acceptable and appropriate to lick the pan. The cookies dried well enough in just a couple hours and were ready for our Memorial Day BBQ. 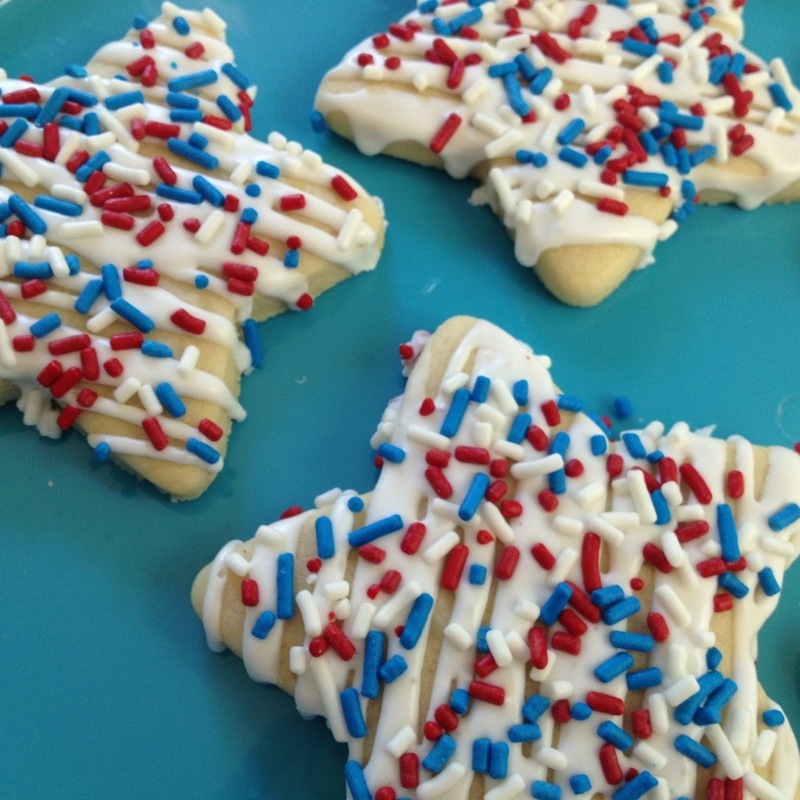 These exact cookies would obviously be perfect for 4th of July too.. but now I am thinking Halloween or Christmas or any other holiday these could be cut with a basic shape and different color combos! My goal when making these cookies was to mimic an amazing Mrs. Fields cookie I had a couple weekends ago while I was in Tahoe. 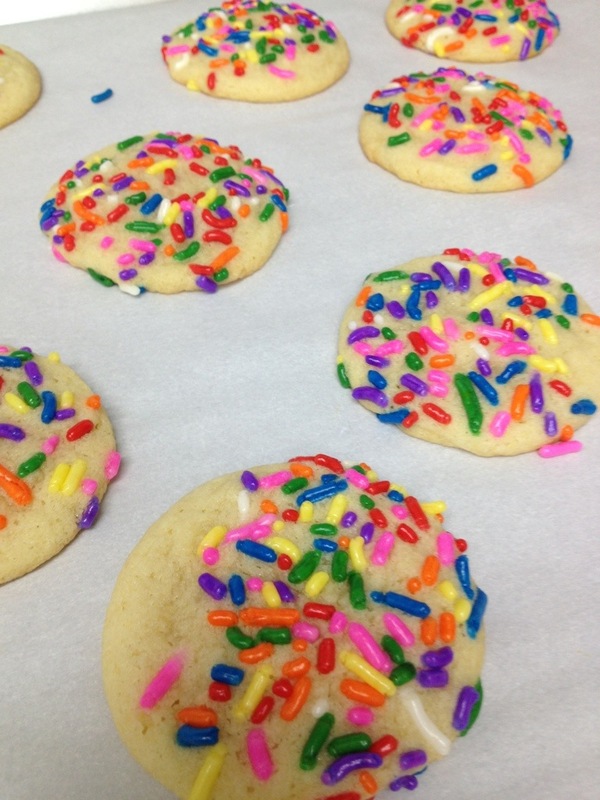 While these turned out nothing like my beloved Mrs. Fields cookie, they were still so yummy and fun and easy that I had to share! 1. Beat butter and sugar until light and fluffy. Add egg and extracts and mix to combine, scraping if necessary. 2. Add the salt, baking powder, and baking soda, then slowly add the flour 1/2 cup at a time. Once fully combined, slowly add the milk. 3. 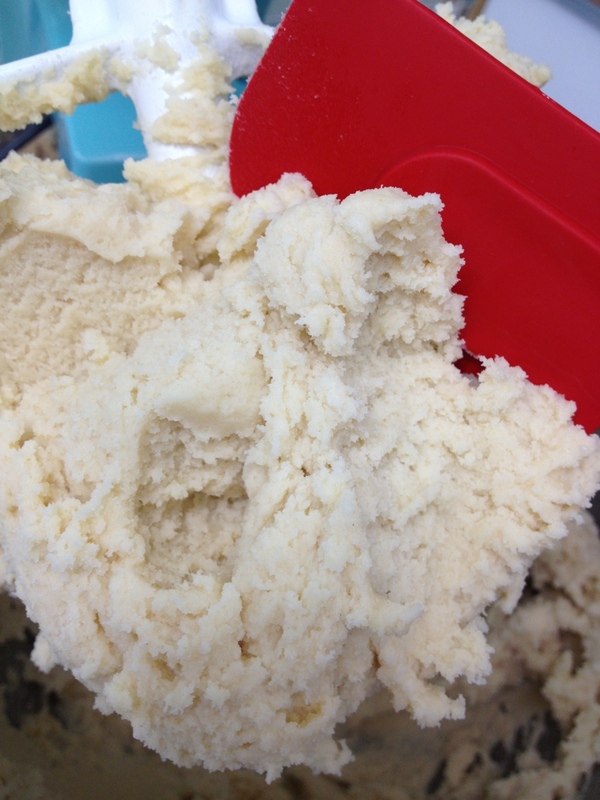 Scoop dough into approximately 1″ balls. I used my small cookie scoop. 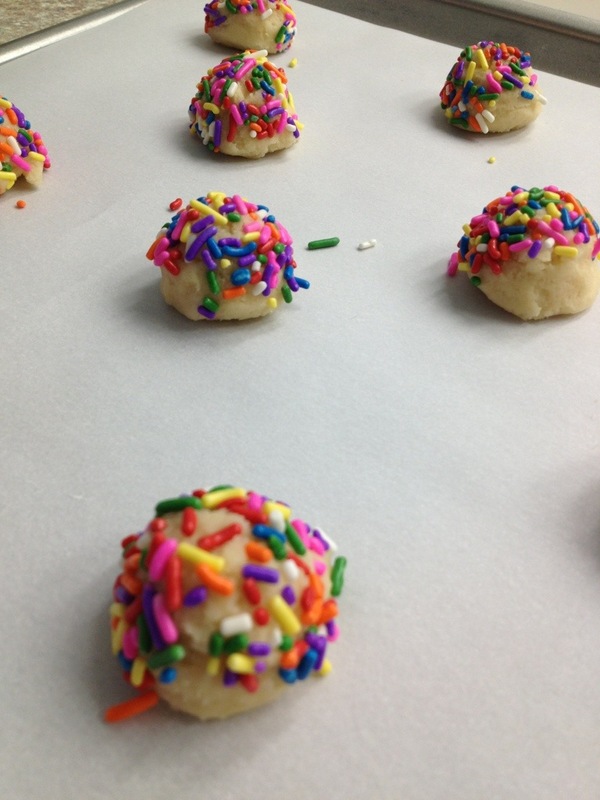 Roll the tops in sprinkles (I used jimmies) and place 2 inches apart on a parchment or silicone lined baking sheet. 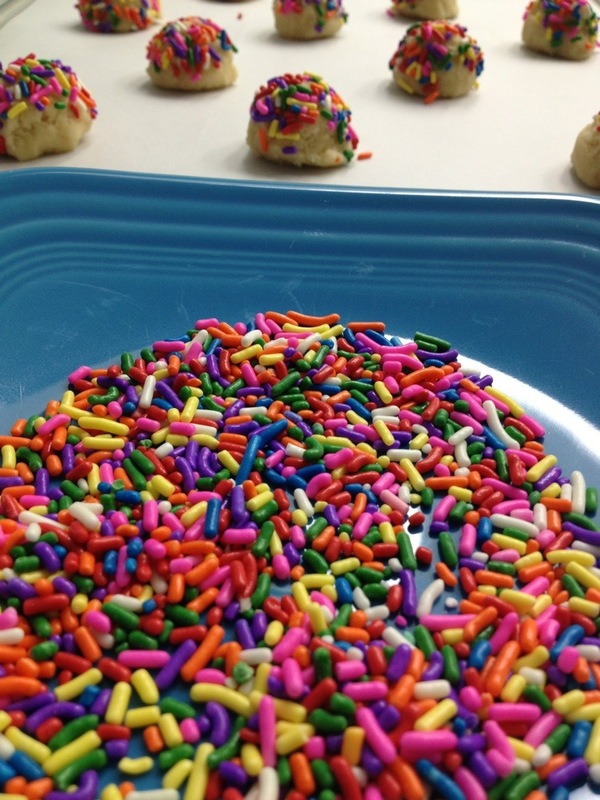 I went a little crazy with the sprinkles. 4. 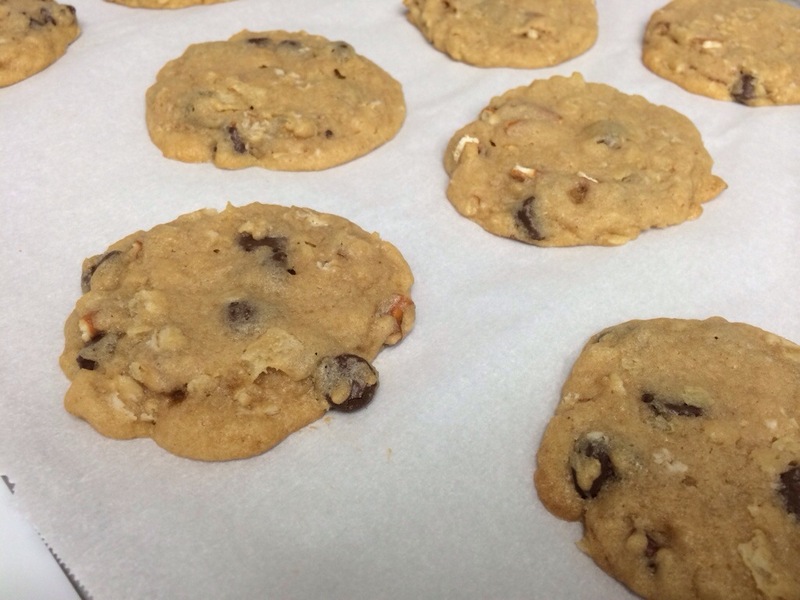 Bake at 350* for 10 minutes, then let cool completely on the cookie sheet. The centers will be soft so you want them to set before trying to move them. My husband loved these! As did my coworkers and ex-coworkers. The batch made about 5 or 6 dozen, so I had plenty to share! 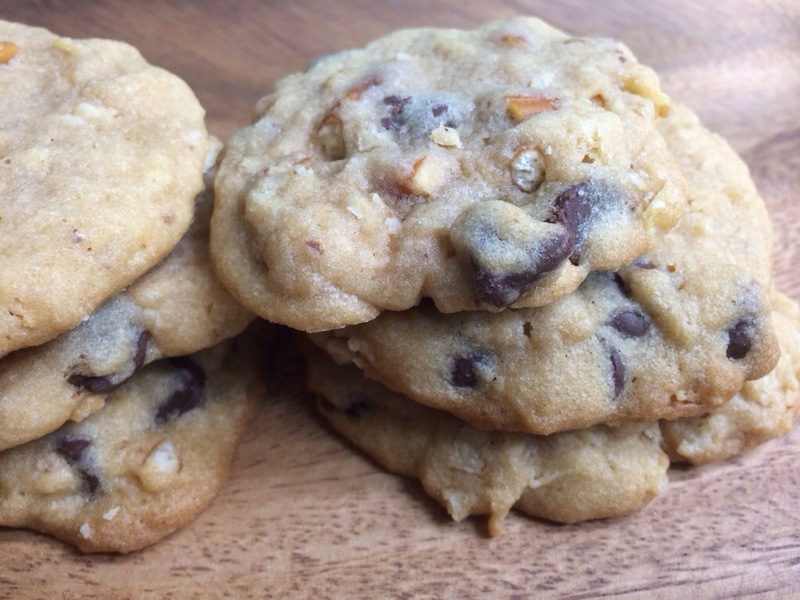 These cookies are EASY PEEZY. 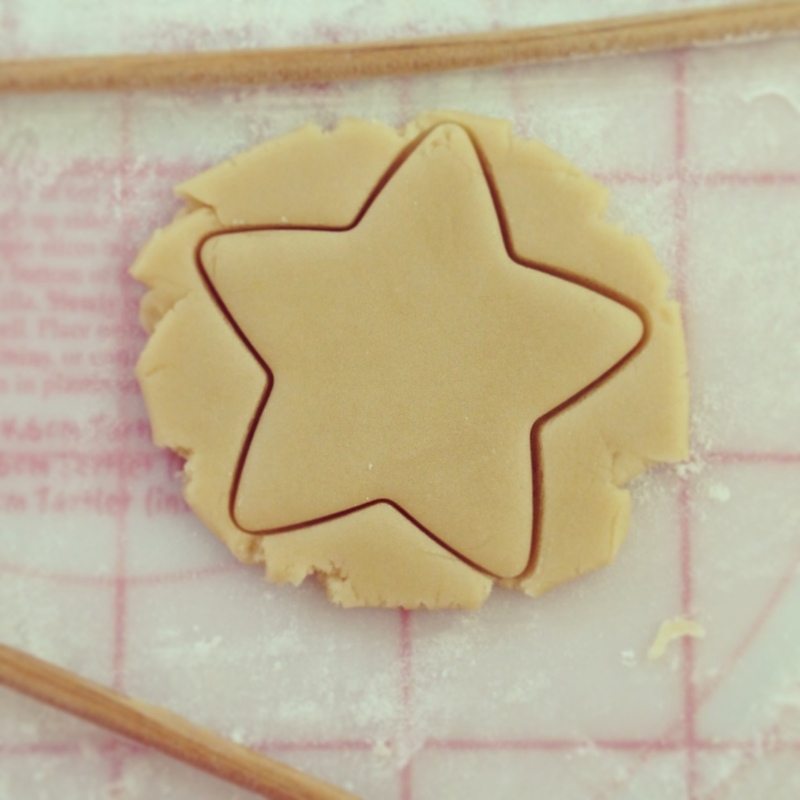 Did you know that I have a tag for easy cookies? In the right column there is a tag cloud of words that I use most often. 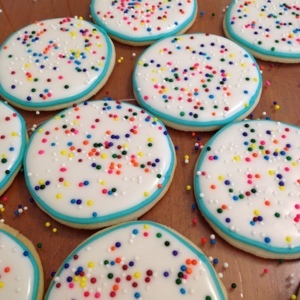 If you find “easy cookies” you will see all the recipes that I tagged like this one. Because they’re so easy!! These start with a basic box of cake mix. 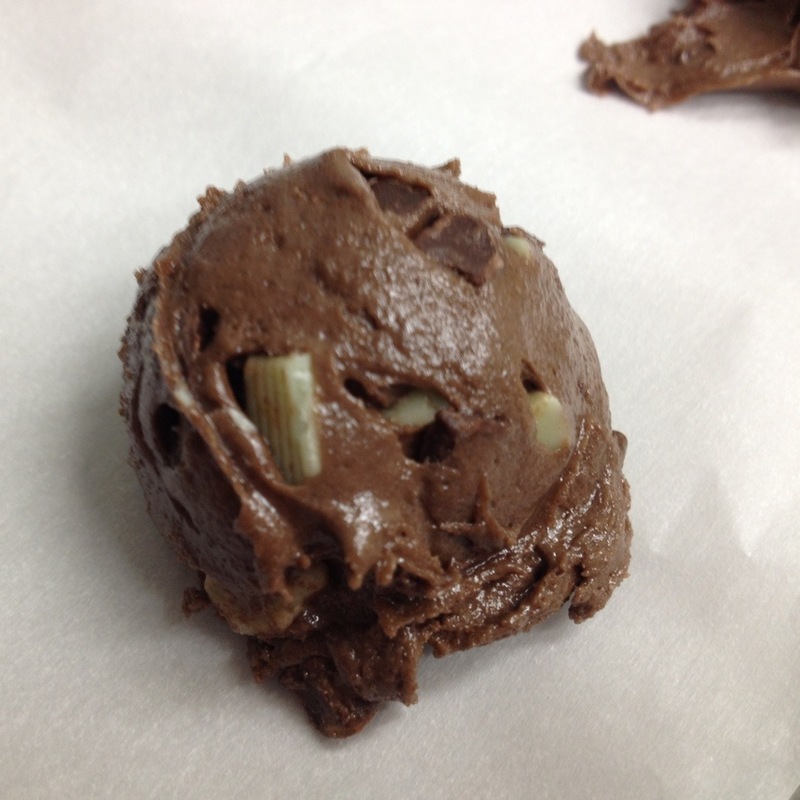 I chose Chocolate Fudge flavor (by my girl Betty) because I wanted them as rich and chocolatey as possible. 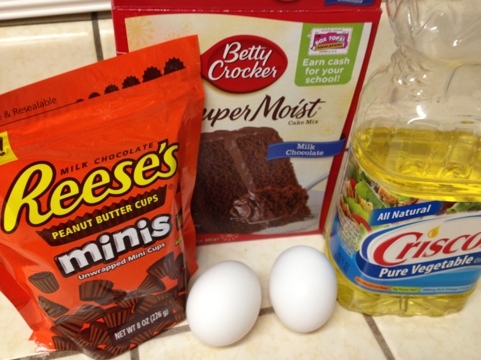 Beat cake mix with 2 eggs and 1/2 cup of oil and voila! 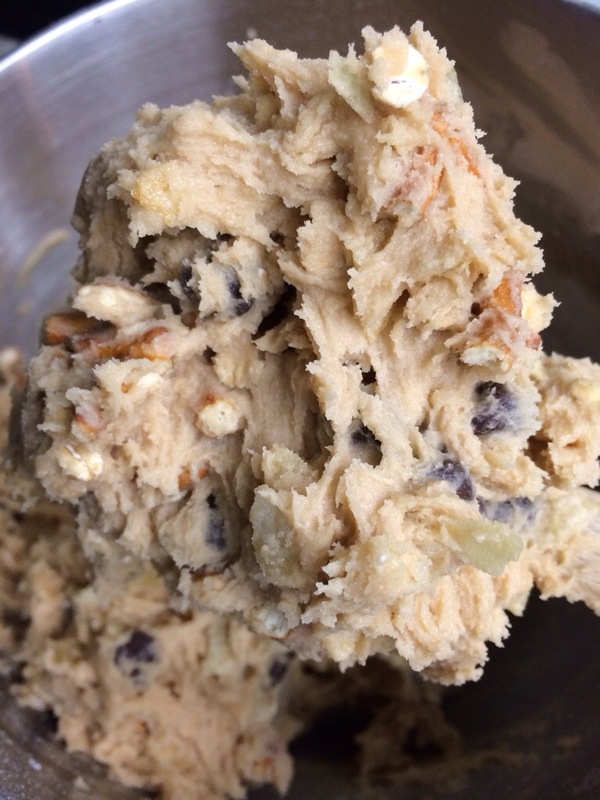 Cookie dough. 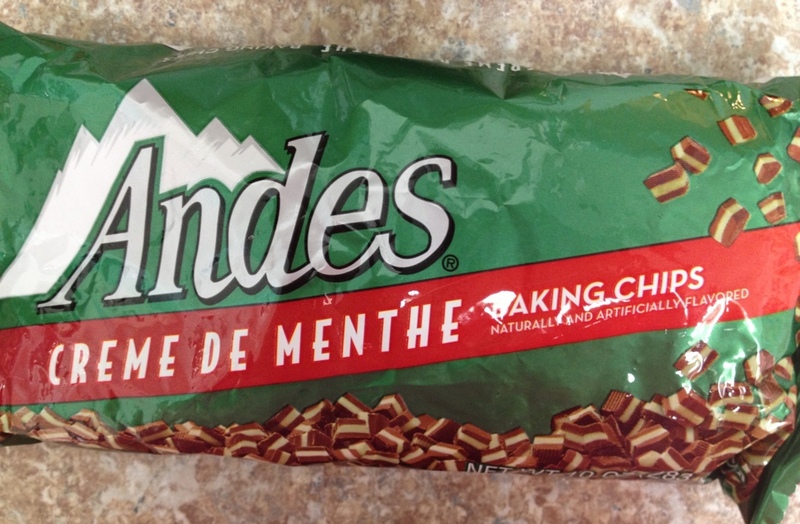 To these I added about 1/2 bag of these wonderous Andes Mint Baking Chips. I have had these for a while and finally got around to making something with them. I thought St. Patty’s day approaching would be the perfect time because they’re green! 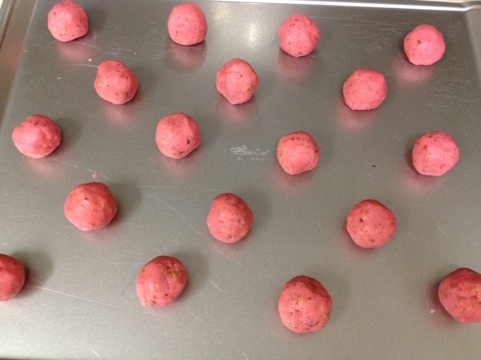 Scoop 1/2 tbsp sized balls onto a parchment lined baking sheet and bake at 350 for 10-12 minutes. 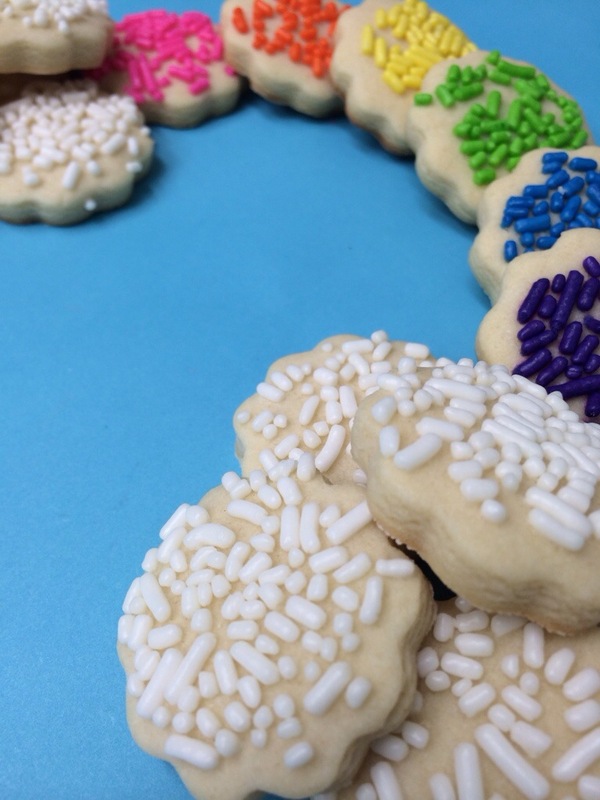 (10 if you like a softer cookie, 12 if you want a crunchier cookie.) I like to use a mini cookie scoop so that they all come out the same size. Let cool for a couple minutes before moving to a wire rack. They come out puffy but deflate a little and set up nicely. These were not too chocolatey (perfect for me) but nicely minty like a girl scout cookie. I had a poll on my facebook page a while back. Rolos vs. Mini Reese’s. But my secret? I really planned on doing both all along. I just couldn’t decide which to do first! My biggest problem is I couldn’t decide what to make with them. I first got the idea to use them in something from Shelly at Cookies & Cups when she made these. I wanted to do something different because I’m not a huge fan of chocolate. 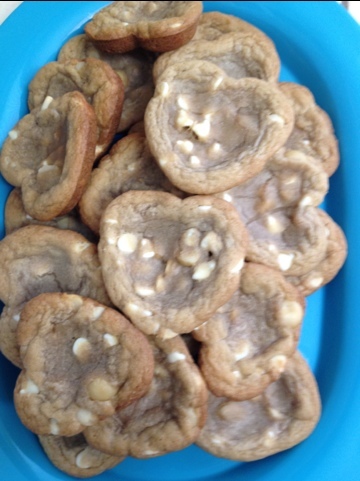 I couldn’t do blondies again, and I didn’t want to do the standard peanut butter cookies, because I don’t love peanut butter that much. I thought of other things I enjoy with peanut butter and Muddy Buddies came to mind. Chocolate, peanut butter, perfect harmony. Then I remembered these brownies. The basic ingredient is chocolate cake instead of brownie mix. And they are gooood brownies. So chocolate cake must be okay. That’s it! 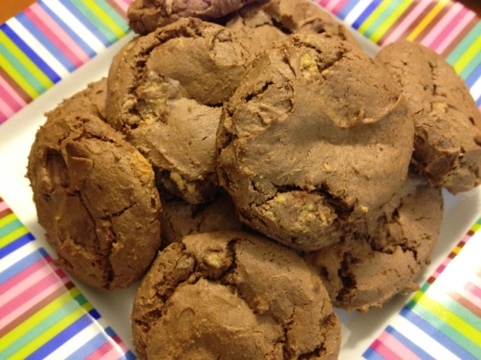 Chocolate cake cookies! And then I realized. That is exactly what Shelly made. I made a full loop and ended up back in the SAME PLACE. So here you have it. Chocolate cake cookies with Mini Reese’s. Mix a boxed chocolate cake mix (I used Milk Chocolate flavored), 2 eggs, and 1/3 cup of vegetable oil. 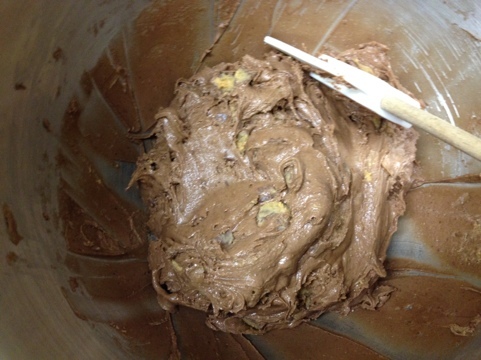 Once the batter is all ready, add in the full bag of Mini Reese’s. Mix it up some more, the cups will break up a bit but that is perfectly okay! 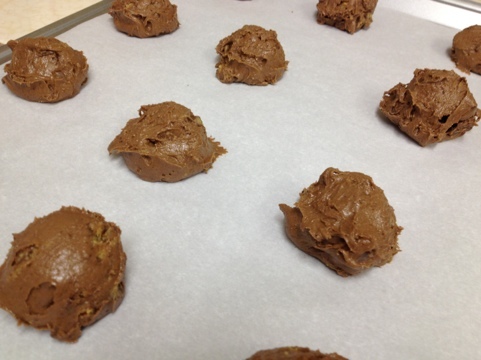 Use a cookie scoop (or 2 tablespoons) to form balls and drop on a parchment paper lined cookie sheet. 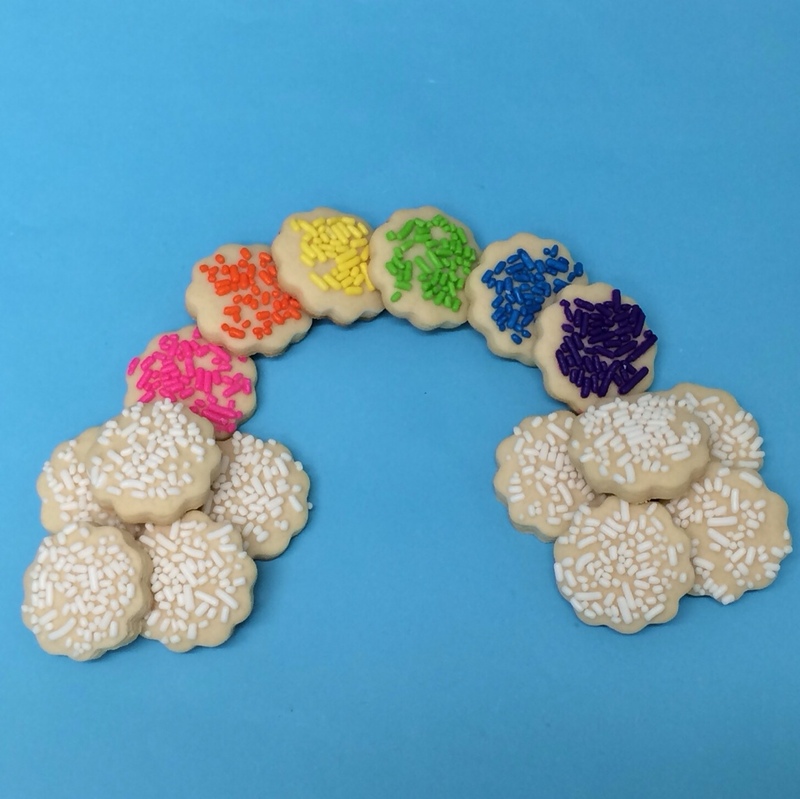 These cookies will spread so keep them a couple inches apart. Bake 9-12 minutes at 350. These are super fast and easy. Whip some up and don’t forget to share! 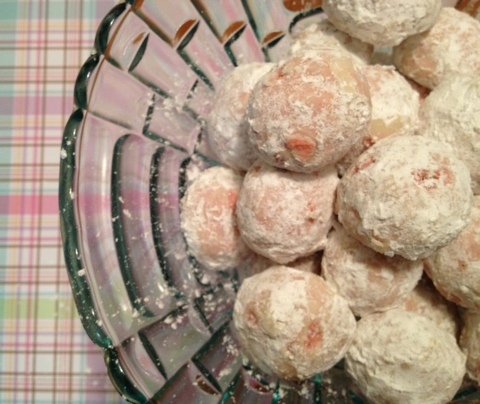 My husband calls these ‘snowball cookies’ but they are also commonly referred to as Mexican Wedding Cookies. I came across these made by the talented Callye of Sweet Sugar Belle, and decided I wanted to make some for Valentine’s day. I’m not so much a red girl, so I opted for the very lovely, very predictable, Pink! 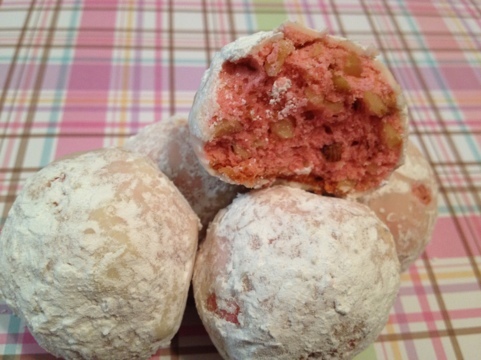 I told my husband about them and he said “oh you mean snowball cookies?” I had never tried or seen them before, but apparently his mom makes them every year for Christmas. I asked her about them and she was happy to share her recipe. I compared it to Callye’s, and it was identical, except Callye’s had 2x more nuts. I texted my mother-in-law to tell her this and she said her recipe had been in the family for generations! How funny that they were the same! 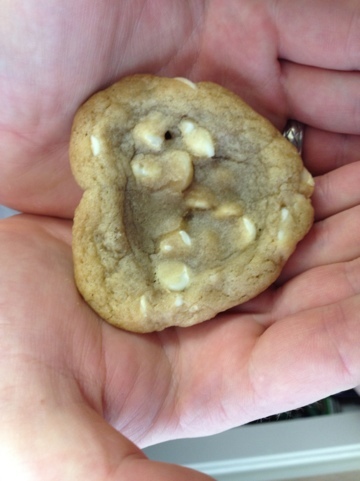 I am pretty much obsessed with walnuts in my cookies, so I opted for the double amount. 1. 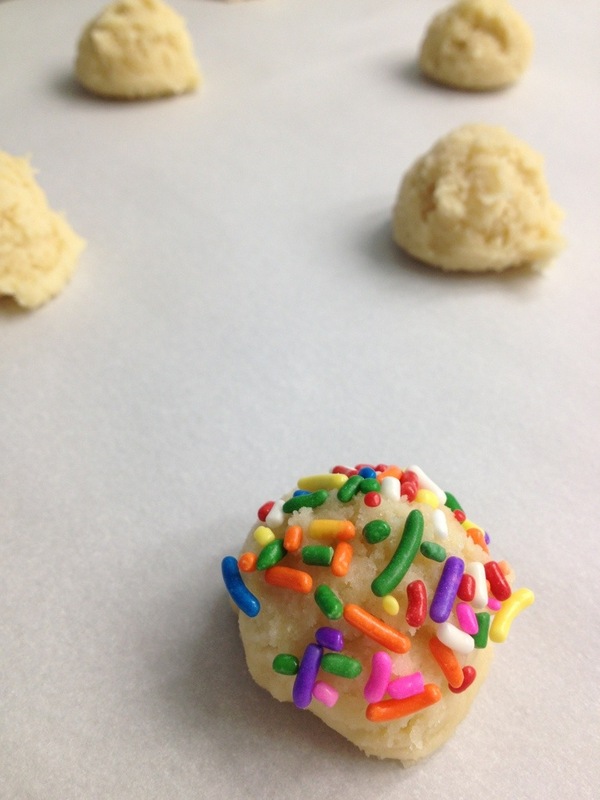 Mix together butter and powdered sugar until fluffy, then add vanilla and food coloring. 2. In a separate bowl, mix together flour and salt, then stir in the nuts. 3. 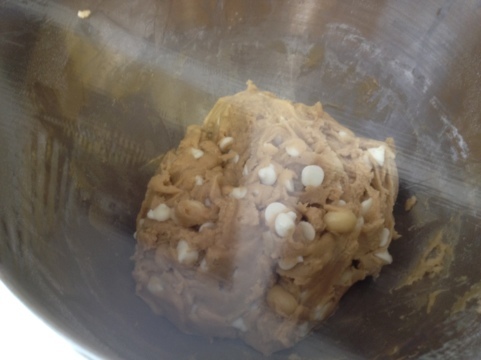 Add flour/nut mixture to butter mixture a little at a time until fully incorporated. 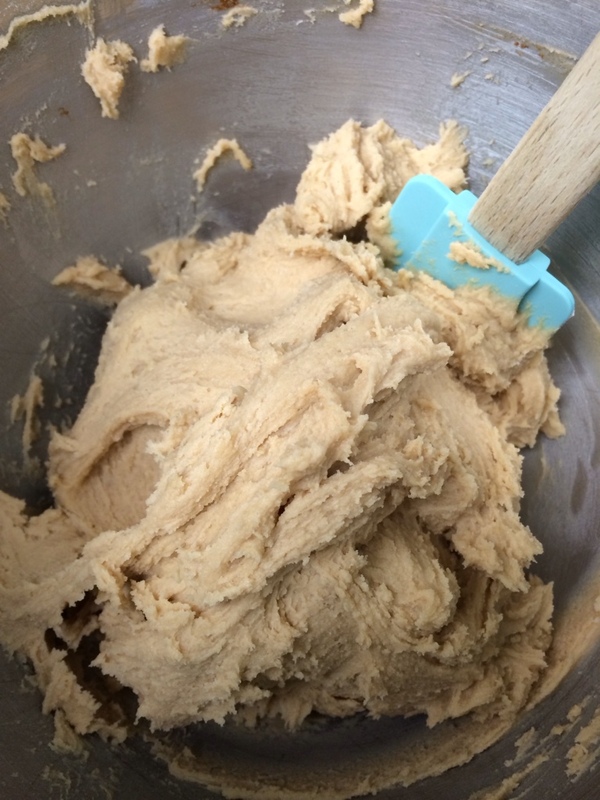 The batter was very thick; I had to make husband stir it with a wooden spoon because my mixer couldn’t take it. 4. 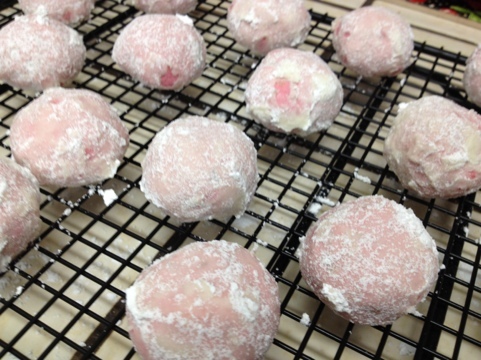 Form into 1″ balls, and bake at 350 for 15 minutes. 5. Immediately after pulling from the oven, roll in powdered sugar then place on a cooling rack. 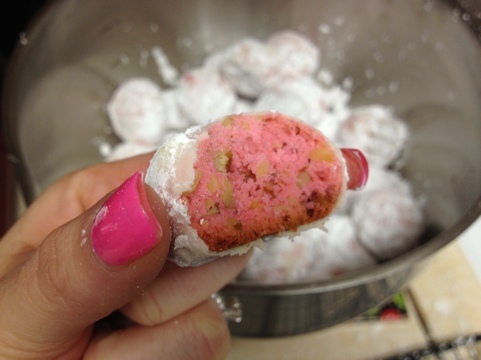 After all cookies are baked and rolled and cooled, roll once more in powdered sugar. 6. Store in an airtight container with the remaining powdered sugar to keep them well dusted. **I just realized after typing this that my mother-in-law’s recipe says to bake at 300 for 30 minutes. 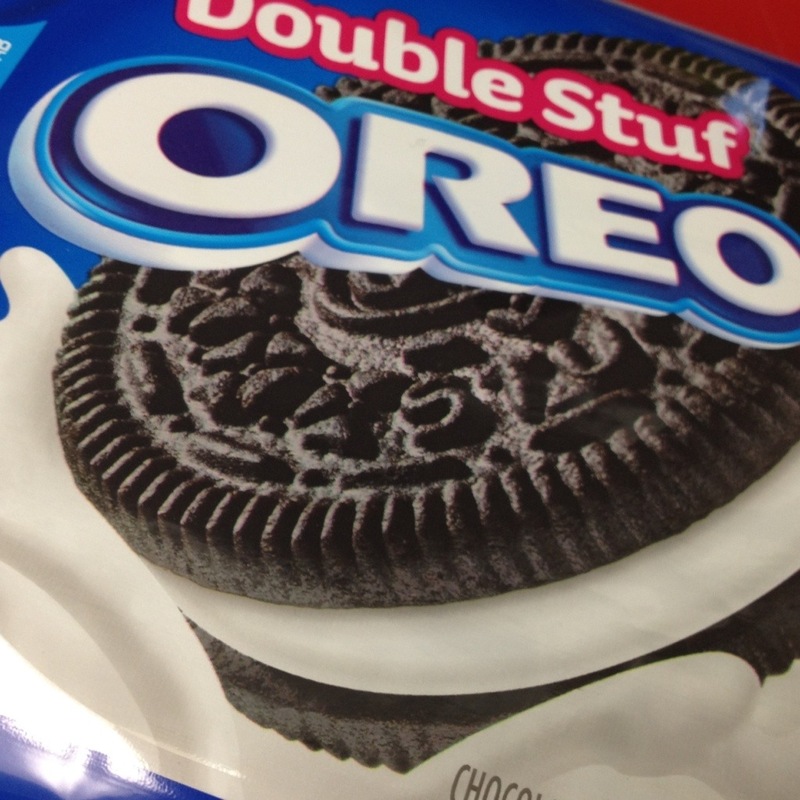 I am curious what difference that would make to these, since they have all the same ingredients. I will have to have her try these and tell me what she thinks?